From now on the preservation of your health is made easier. 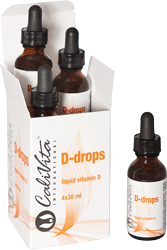 We present you D-drops, CaliVita®’s latest vitamin D formula. We have created D-drops so that its use could be simple and easily personalized for every member of the family. 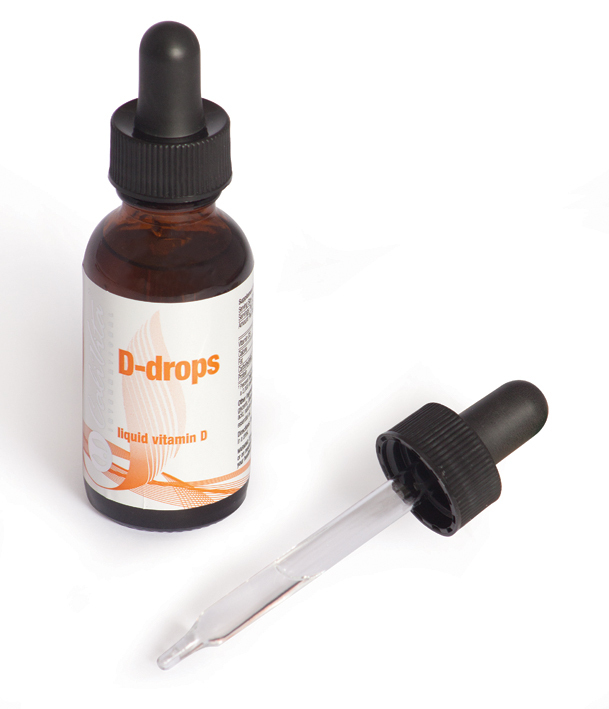 Being a liquid formula with a dropper, it is easy to dose in a personalized way, either for children or the elderly. Its taste is pleasant due to its natural citrus ingredients and at the same time it is not overly characteristic, so it can be mixed into foods and beverages. In the course of manufacturing this liquid formula we do not apply any artificial flavors, sugar, sweeteners or artificial colorants. In view of the results of the past few years, several medical organizations, including the National Health Institute of Harvard University, support the idea of increasing the present officially recommended daily dose of vitamin D by at least 30-60%. Its supplementation is especially important in dark, fall and winter seasons, in pregnancy, for bodies in development, following menopause, in old age as well as in the case of absorption problems and obesity. With the help of CaliVita® you also can do something for your health in an extremely simple and effective way with natural ingredients. Take this opportunity. Store away from direct sunshine. Do not apply in the case of hypocalcaemia. In the case of kidney stones and sarcoidosis, consult your doctor. In the case of applying any other formula containing vitamin D, consult your doctor. Very little sunlight. The sun shines mainly above the clouds. Therefore, it also doesn’t warm anything. It is cold and dark. Or is it simply winter? From October to April our skin hardly produces vitamin D. And if during months with sunshine we protect our skin properly against the much talked about skin cancer, or simply sit too much in the office, our body is not able to be supplied with adequate amounts of vitamin D.
For a long time people believed that bad mood is due to lack of sunshine, shorter daylight periods and cold, uncomfortable weather in the Fall and Winter. Experts have also attributed a higher frequency of mental illnesses and depression to this season. However, there is a way around it! Several studies have revealed what causes this condition and achieved positive results using natural active agents such as omega-3 fatty acids. The latest results also highlight the importance of vitamin D.
Both patients diagnosed with depression as well as healthy people struggling with seasonal lethargy were found to have lower than optimal vitamin D levels. Although it has not yet been clearly proved whether the lack of vitamin D is a cause, result or it accompanies the condition, it seems that its supplementation has a beneficial effect on our mental state. A study conducted in 2011 showed that patients struggling with winter depression experienced significant mood improvements after receiving vitamin D.
Keep in mind that vitamin D beneficially impacts your immune system! On one hand, it intensifies our resistance against pathogens, on the other, it inhibits autoimmune inflammations. It has been observed that in the winter months autoimmune illnesses cause more difficulties then ususal; some experts assume that this is linked to the lack of vitamin D, which is common in this period. Using vitamin C can also contribute to mood improvement as it can not only support our immune system but, much like vitamin D, it also plays a role in the production of dopamine, responsible for mood control. Recent research shows that, contrary to our previous knowledge, the role of vitamin D in human body is extremely complex as it can beneficially impact not only physical but also the mental state. It is virtually liquid sunshine! 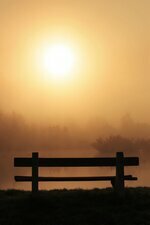 Do not think that you do not need vitamin D in the spring! Almost 50% of Europe's population does not get enough vitamin D even during sunny months. In winter, this percentage increases to 70% -80%. It is not difficult to imagine what would be the results in people not so leading active lifestyles or suffering from various health problems! 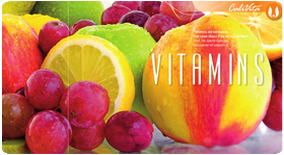 So supplementation with vitamin D is necessary even in spring and summer. The sun is shining in vain if we sit in the office from 8 to 5! We can obtain sufficient quantity of quality sunlight only if we regularly sunbathe. Adequate sunlight varies during different seasons and in different regions. It is important to know that however great is the ability of our skin to synthesize vitamin D, it will not continue to increase after a certain dose of radiation. That is why we should not delude ourselves that after 2 weeks vacation we can load our body with enough vitamin D for the year, especially if we spent those two weeks in repairing our home. And do not forget about children addicted to television and computers! Family doctors and dermatologists continue to advise us to protect skin with appropriate clothing and sunscreen, especially if you are constantly exposed to the sun (people working outdoors, children on holiday). Sunscreens with a factor greater than 8, however, reduce the formation of vitamin D with more than 90% but at the same time reduce the risk of skin cancer. With aging, thinning of the skin, reducing the kidney's ability to transform vitamin D and the development of various diseases reduces the ability of our body to make vitamin D. Absorption disorders of fat, vegetarian and low in fish diet, obesity, smoking, lactose intolerance, sun allergy, pigmentation risk in darker skin, these are reasons enough to defend from the sun, but also leads to reduced levels of vitamin D in the body. Neither winter nor summer we consume enough food containing vitamin D or fortified with vitamin D. Even experts say that we are not only able to comply diet with the new recommendations on taking an excessive amount of vitamin D, as one would to consume 33 eggs or more than 6 kg of fish per day. 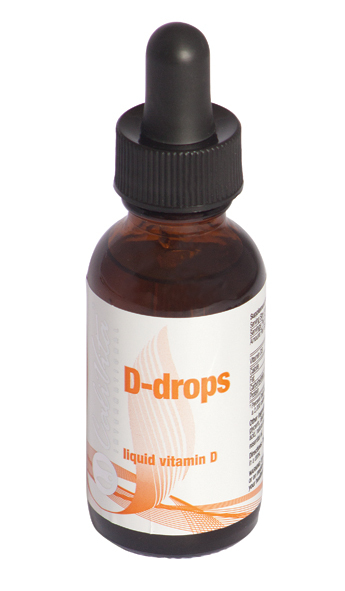 D drops, containing vitamin D3, the most effective form of vitamin D, derived from a natural source - with orange and lemon flavor is a simple solution for the whole family. Natural liquid formula with a dropper. No sugar or sweetener added. No artificial flavors and colors. Keep the bottle tightly closed in a cool, away from moisture and high temperature. Do not freeze. Do not use in case of hypercalcemia! When kidney stones and sarcoidosis consult a doctor! If you are taking other formula containing vitamin D, talk to your doctor!